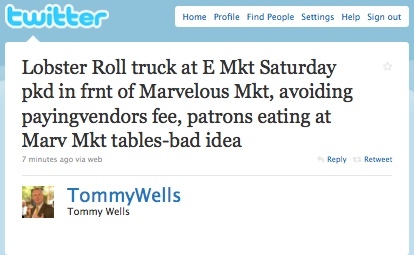 Considering the heated, ongoing food truck war, this is the last thing trucks should do. The strongest argument that brick and mortar restaurants make against mobile purveyors of noms is that the status quo is unfair, mostly because of the different taxes food trucks pay vs. traditional restaurants. If a truck is avoiding paying a vendor fee, that’s unfair, as well. Also– allowing customers to cannibalize another establishment’s amenities in order to chow down on $15 lobster rolls? That’s…tacky. One would expect more from both the purveyors and patrons of such a WASP-y concept. My word, I’m clutching my pearls, as I type. I’ve reached out to Lobster Truck DC for comment, will update you all if I receive one. UPDATE: I spoke to Lobster Truck for a few minutes this afternoon, but they couldn’t hear me/seemed unavailable, so I asked them to call me later this evening. I’ll keep you posted. What can vouchers do for D.C.? "A New Era of Polarizing Racial Politics in the District"
← Pole positions; it’s all about class. The lobster truck is the worst – they have also parked in front of the patio seating at Circa in Dupont, killing the atmosphere and making it impossible to hear anyone, let alone the fumes…I will never buy anything from them because of their ridiculous tactics and refusal to be courteous. This is just unbelievable, what will they come up with next? There is also patio seating in the back, so the patrons of that restaurant can go sit back there. I know it is closed back there sometimes, so maybe it is a good idea to ask before just going and sitting in the back! Considering I go to this place all the time, I doubt they would have a problem with it!